In 1966, Guitar Instructor at Shobi Music Conservatory in Tokyo, Japan for 7 years. In 1973, studied at Vienna Music Academy with world well- known guitarist Prof.Luise Walker and learned music Theory,Harmony, Solphage, History, Instrument history and others. 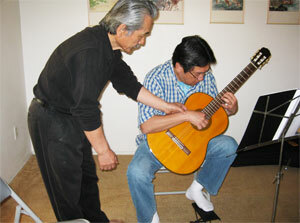 Residing in U.S. since 1977, teaching classical guitar many students through out the United States. Residing in San Diego since 1985, teaching classical guitar for children and adults.